Amusement parks are notorious for their rapidly moving roller coasters, adorable playgrounds for children, attractive cartoon impersonators, and many more. If you are a fan of water parks or rides that give you adrenaline rush, Legoland® Malaysia would be a great deal for you, your friends, and family. Below are 8 reasons why this is a highly recommended amusement park. Located in Johor, this is one of the most renowned amusement parks in Malaysia, which is frequently visited by both local and international tourists. Being the first to establish in Asia, Malaysia is able to globally promote what Johor has to offer. This is where stunning resorts are located, offering excellent hospitality nobody can ever resist especially after a long tiring day of playtime at the amusement park. Legoland® Malaysia gets your body to work actively during the day when you scream your lungs out as you go up and down on high-speed roller coasters or even when you work your muscles underwater as you swim your way around its water pools. This is also where kids will get to learn and do things they never thought they would be allowed to do. Who says you have to always play outdoors just to have fun? Legoland® Malaysia offers you a spectacular indoor experience that does not even get the sweat out of you! This fully air-conditioned MINILAND proudly showcases over 2,000 famous LEGO Star Wars models as well as iconic scenes from all six episodes including the Star Wars™ The Clone wars animated series – something all Star Wars fans should look out for. Apart from miniatures, the park also promotes sensational Star Wars characters such as Yoda, R2-D2, Darth Vader, and one of the most prestige characters, the Sith Lord – all made of LEGO bricks. Whether you are coming with a bunch of Star Wars fans or with your parents who might have never watched Star Wars, this is undeniably a great place for friends or family bonding. No stereotype when it comes to amusement parks because adults also deserve to have fun as much as kids do. Legoland® Malaysia does not discriminate its visitors by age, which is why both kids and adult attractions are fairly offered. The thing about LEGO bricks is that they just remind us of our childhood. This is exactly what the park tries to deliver after all –to let our children experience what it was like for us when we were first introduced to such amazing toys. The only difference is that Lego bricks are no longer limited to playtime at home but are now open for playtime outdoors, which is a pretty genius concept, especially when parents nowadays are always struggling to help their kids when it comes to fighting obesity. Here, kids and adults can enjoy fun LEGO bricks activities where their skills are being tested on. 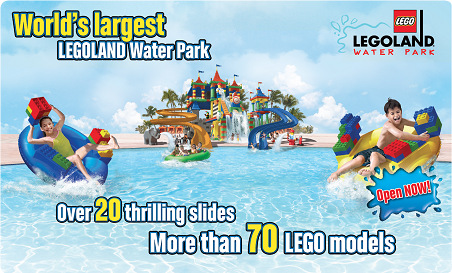 After being pampered with LEGO bricks, it would be nice to get yourself wet in Legoland® Malaysia Water Park. This can also be an exciting place of fun where parents can teach their kids how to swim, splash water at one another, and even play water volleyball. Whichever water activities you may want to venture into, be sure to always stay alert while you swim with LEGO and of course, have fun! Companies these days make millions, even billions on hotels, casinos, and amusement parks. Whatever their end goals are, it always melts my heart to know that there are businesses out there that actually support charity. 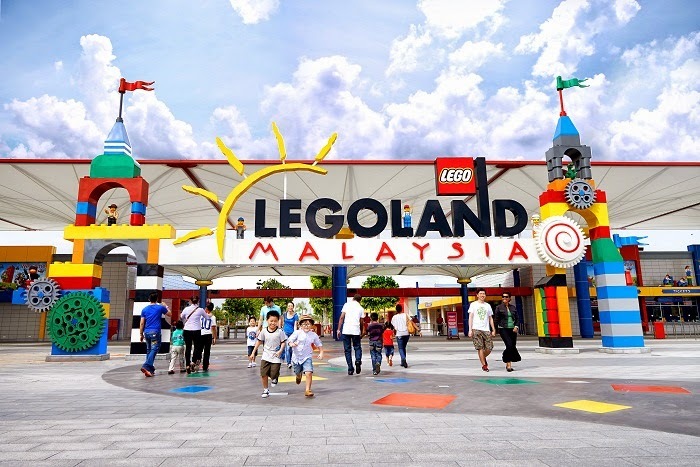 Legoland® Malaysia is not just any amusement park that only aims to make money but also dedicates some of its earnings to charity organizations. In 2013, Legoland® Malaysia gave away 15,000 tickets to charity. Well, that’s a whole load of free tickets! The park shared its blessings with Johor’s most underprivileged children with the help of 25 organizations. We all can be part of its noble activities when we live our experience at Legoland® Malaysia and when we encourage others to also be part of such great efforts. We don’t always find LEGO bricks wherever we go. Buying LEGO souvenirs would definitely be meaningful because now, you don’t even have to have them as toys but also as souvenirs! Explore the park’s Mini Market, The Big Shop, King’s Market, The Brick Shop, and Adventure’s Depot. As its name claim itself to be, The Big Shop is the largest store here, offering the largest selection of LEGO toys and limited edition items. Customers can also buy attractive costumes from the King’s Market – a place where they can imagine themselves living in a different, dreamy kingdom. Nobody likes to be hungry or thirsty, especially in a hot sunny weather. This is why Legoland® Malaysia always ensures that its visitors are re-hydrated and satisfied before and after playtime. The park offers an array of food and beverages to suit different palates. There are 7 different types of restaurants here, from Western to Asian cuisines that will make your mouth water. Food prices are also affordable, giving you and your loved ones an enjoyable and affordable meal together. Not only does the park offer creative and stunning looking surroundings, it also gets you pampered by its wonderful high-class hospitality. Kids may not appreciate the elegance of interior designs, but one thing is for sure, they would be impressed by cute and pretty designs of the Legoland® Malaysia hotel. Located at the park’s main entrance, the new LEGO themed hotel will not only give you massive number of likes on Facebook and Instagram, but it will also give your kids an experience that they’ll never forget. For college students, this would be a great place to spend your semester break. Legoland® Malaysia has so much to offer, including events that will make your day as long as you want to be part of the park’s latest and coolest events. If you are planning to celebrate your school or seasonal holidays outside of Kuala Lumpur or even Singapore, why not spend great times with your friends and family at Legoland® Malaysia? The park is always catching up with trending events, which means you’ll get to enjoy fun and exciting activities that any year has to offer! So, are you ready for Legoland® Malaysia? We will help to get you there! Check out our transport to Legoland services today and let us help you plan your trip. Visit www.johortransport.com for details.